For over 21 years my family called the great state of Alaska home. We thrived during the long, dark winters and cherished every sunlight filled day of our short summers. Living in the rugged and beautiful Last Frontier was the adventure of a lifetime and one we long for others to experience. Moving to Colorado revealed the perfect place to make my long held dream of opening an Alaskan inspired bar and restaurant a reality. We envisioned a cozy place where people could hang out with friends and enjoy great food and drinks, and we hope we've done just that. I invite you to join us and share in just a taste of our time in the 49th state! Check out our specials on our scrolling "social" tab! House pub chips topped with melted blue cheese crumbles, bacon, buffalo ranch and balsamic glaze. Alaskan Amber beer cheese served with a mountain of CRUNCHY pretzels. House smoked wild Alaskan salmon blended with cream cheese, dill, and lemon juice. Served with toasted baguettes and fresh veggies. Over a pound of crispy smoked wings served with blue cheese dressing and celery. Your choice of up to two sauces: AK buffalo, cajun dry rub, BBQ, Jamaican jerk, or jalapeno-lime jam. 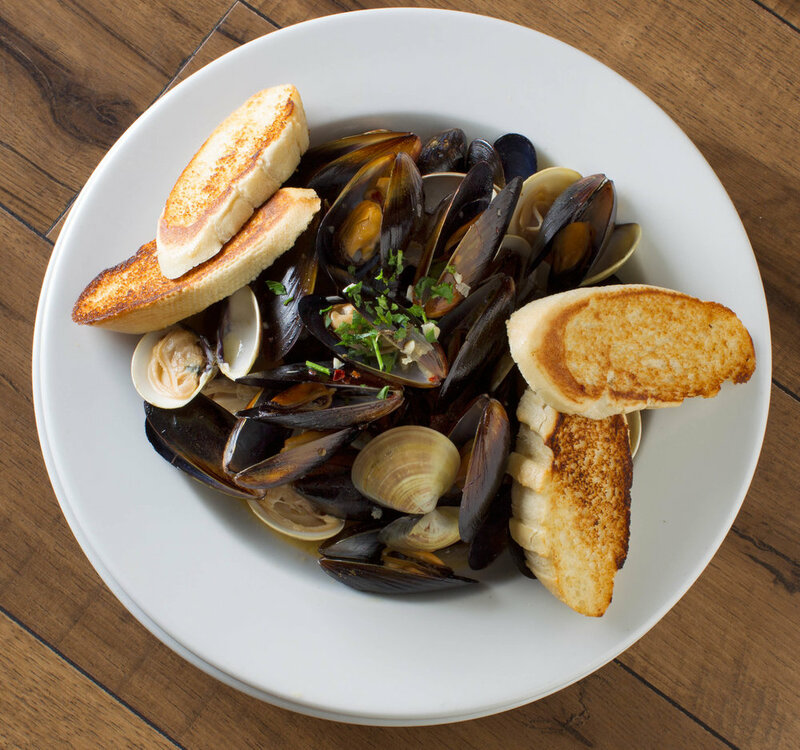 A full pound of either clams or mussels steamed in a white wine and lemon sauce. Served with toasted baguettes. Two jalapeno cheddar sausages skewered and fried crispy in Alaskan Amber beer batter. Served with house mustard. A trio of scratch made seafood cakes - crab, salmon, and cod. Each is accompanied by its own sauce and garnished with crispy onion straws and grilled citrus. Fresh jalapenos stuffed with bacon and goat cheese. Fried and drizzled with peppered honey and balsamic glaze. Classic, creamy, cheesy hot crab-artichoke dip served with fresh veggies and toasted baguettes. A monumental burger of two patties topped with caramelized onions, cheddar cheese, crispy bacon, and horseradish mayo. Lettuce, tomato, & pickles on the side. Just a bit smaller - one patty with all the same fixins. Topped with pineapple cream cheese, candied bacon, and fresh jalapenos. Topped with blackberry bourbon glaze, blue cheese crumbles, and fried jalapenos. 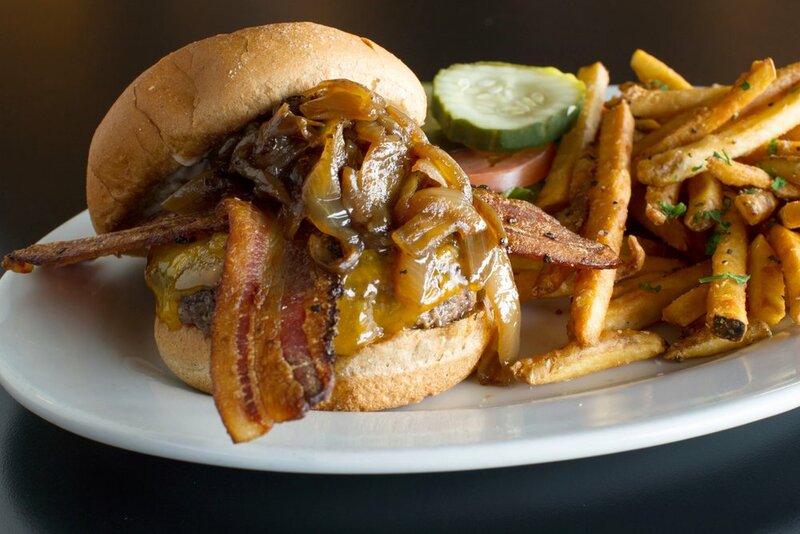 A bear of a burger served with housemade bacon jam, swiss cheese, crispy onion straws, and grilled apple. Here to heal with cheddar cheese, fries, crispy bacon, and an over easy egg. Spicy buffalo wing sauce, melted blue cheese crumbles, and crunchy carrot-celery law. Sharp cheddar, brie, swiss cheese and our 49th sauce all melted onto toasted sourdough. Grilled chicken breast on toasted sourdough with swiss cheese, crispy bacon, avocado, lettuce, tomato, onion, and 49th sauce. Try with blackened or Jamaican jerk chicken. Packed with flavor and topped with lettuce, tomato, crispy onion straws, and 49th sauce. Alaskan Amber beer battered wild Alaskan cod topped with our spicy tartar sauce, lettuce, and sliced tomato. Five slices of peppered bacon on toasted sourdough with our 49th sauce, lettuce, tomato, and crispy onion strings. Smoked turkey breast on toasted sourdough with cranberry mayo, swiss cheese, lettuce, tomato, and caramelized onions. 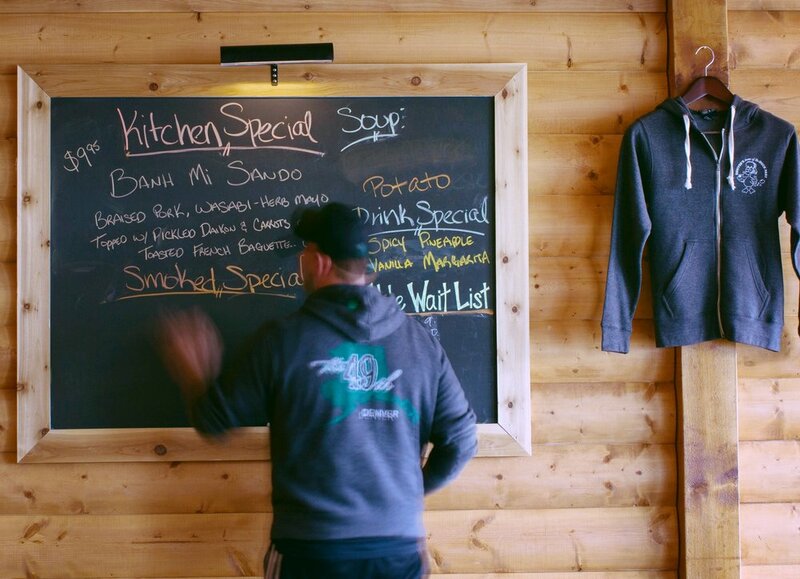 Your choice of either half the Talkeetna Turkey sandwich or half the Buckland BLT with your choice of side. 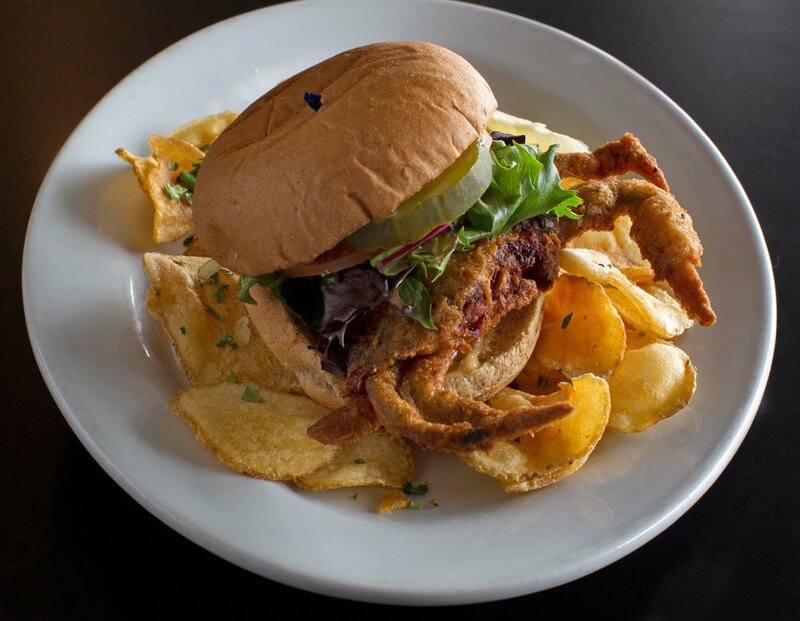 Whole softshell crab fried and served on a whole wheat bun with lettuce, tomato, pickle, and Old Bay aioli. Classic tossed Caesar salad topped with house made croutons and blackened wild Alaskan cod. Mixed greens, hardboiled egg, blue cheese, bacon, and tomatoes topped with blackened wild Alaskan salmon and your choice of dressing. Al dente pasta with grilled chicken, mixed veggies, house made croutons, and parmesan cheese all tossed in our balsamic caesar dressing. Mixed greens, fresh apple, candied walnuts, and cranberry compound goat cheese. Served with raspberry jalapeno vinaigrette. Mixed greens with cucumbers, tomatoes, shredded carrots, parmesan, and house made croutons. Your choice of dressing. A steaming bowl of housemade soup. Ask your server what's cookin'! A mug of our housemade soup served with a mixed greens salad and choice of dressing. Two slices of elk & beef loaf served with bacon green beans, garlic mashers, and housemade pan gravy. Golden beer battered fish served with our spicy tartar sauce, lemon wedges, and fries. Grilled wild Alaskan salmon finished with a spicy chipotle glaze and served with sauteed veggies, citrus rice, and pico de gallo. Our decadent chocolate blackberry brownie is served warm with a scoop of vanilla bean ice cream and drizzled with our signature blueberry sauce. Ask your server what today's flavor is! Warm homemade cobbler served with vanilla bean ice cream and drizzled with our signature blueberry sauce. Rotating cheesecake flavor. Ask your server what we've baked up for you! Brunch served Sat & Sun from 11am - 2pm. Regular menu also available. Cocoa Puffs cereal served with whole milk. Toasted sourdough bread topped with two fried eggs, cheddar cheese, tomato, and 49th sauce. Served with breakfast fries. Four pieces of drunken cinnamon French toast served with our signature blueberry sauce and spicy candied walnuts. 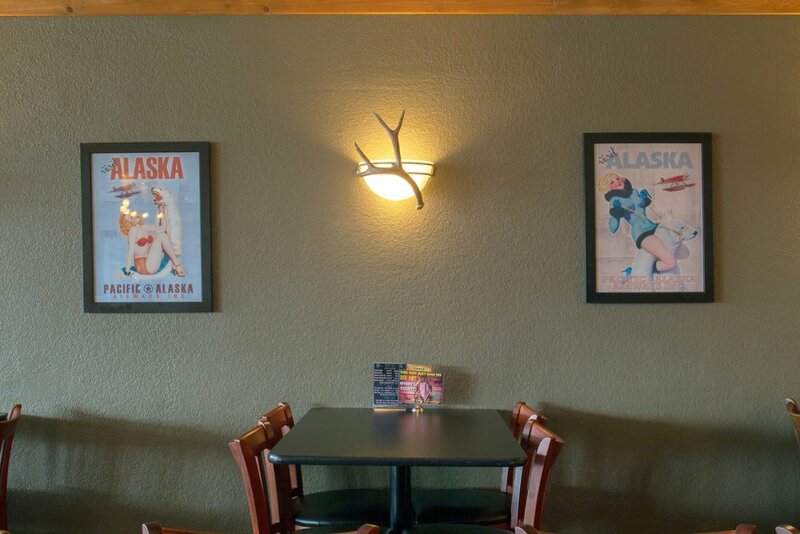 Besides our specialty cocktails we are proud to serve 7 Alaska Brewing Co. beers on draft, domestic beers on draft and in bottle, wine, and a full bar! Sis's scratchmade mix, a loaded skewer, & freshly cooked bacon. Your choice of horseradish vodka, pickl-cini vodka, or serrano tequila. A refreshing blend of Pimm's liquer, sprite, soda, and lemon. Add peach vodka and make it a Panda Punch! An Arctic favorite made with huckleberry vodka. Bourbon, TANG, spices, and black tea. Served hot in a camping mug. The signature shot of Alaska. Our take on a Moscow Mule with bourbon, blackberry, and maple syrup. This version of a Long Island is as big as Alaska and strong to boot. With or without strawberries. House infused strawberry-serrano tequila and organic margarita mix. Located off Kipling between Belleview and Quincy. Turn at the Stanford light into the shopping center.